After J. Cavarelli and D. Moras, in "tRNA: Structure, Biosynthesis, and Function" (D. Soil and U. RajBhandary, eds. ), p. 412, ASM Press, Washington DC, 1995. Figure 3.11. Space-filling models of the complexes of tRNAs with ARSases of the two classes. Class I: GlnRS:tRNAGln complex. Class II: AspRS:tRNAAsp complex. The opposite sites of approach of the tRNA molecules by the enzymes are demonstrated. (Reproduced from M. Ruff, S. Krishnaswamy, M. Boeglin, A. Poterszman, A. Mitschler, A. Podjarny, B. Rees, J.C. Thierry & D. Moras, Science 252, 1682-1689, 1991, with permission). presence of the so-called Rossmann dinucleotide-binding fold (earlier found in dehydrogenases, kinases and many other proteins utilizing ATP or other high-energy nucleotides), as well as by two conserved sequences - His-Ile-Gly-His and Lys-Met-Ser-Lys-Ser - localized within or in the vicinity of the catalytic center. The classical Rossmann fold is formed by repeating pap-motif in such a way that six-stranded parallel p-sheet is found to be sandwiched between two pairs of a-helices (see, e.g., domain 1 in Fig. 10.4 and G-domain in Fig. 12.2). The C-terminal half of the enzyme participates in the specific recognition of tRNA molecule by interacting with its anticodon loop and stem. The enzyme as a whole approaches tRNA molecule from the side of its D-loop and from inside of the L, contacting with the minor groove of the acceptor helix (Fig. 3.11). 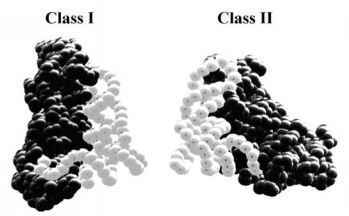 Class II includes Ala-, Asn-, Asp-, Gly-, His-, Lys-, Phe-, Pro-, Ser-, and Thr-RSases, all of which being composed of two or four subunits (Table 3.1). Their folding pattern is quite different from that of the class I ARSases. First of all, their ATP-binding and catalytic domain is constructed as a seven-stranded antiparallel p-sheet (see, e.g., domain 2 in Fig. 10.4 and domain II in Fig. 12.2), in contrast to the Rossmann fold of class I ARSases with its parallel p-sheet between two layers of helices. The catalytic domain also contains relatively conserved, class-defining sequence motifs, but having nothing in common with the motifs in class I enzymes. This large domain involved in ATP-binding, amino acid binding, tRNA acceptor end binding and catalysis may constitute, as in the cases of Asp-, Asn-, Lys-, and Ser-RSases, the C-terminal part of the enzyme, whereas the N-terminal part participates in interactions with the distal region of tRNA such as anticodon. In other class II synthetases, however, the catalytic domain may be at the N-terminal end (e.g., in Thr-, Pro-, His-, Gly- and Ala-RSases). Each subunit of the enzyme binds one tRNA molecule. 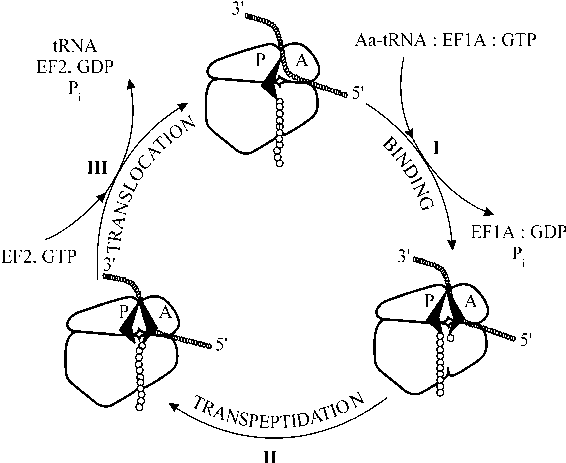 On the whole, the enzyme approaches the tRNA molecule from the side of its variable and TY loops and contacts with the major groove of the acceptor stem helix (Fig. 3.11), i.e. differently from the way of the interaction in the case of class I synthetases. Several characteristic features of eukaryotic aminoacyl-tRNA synthetases, primarily of animal aminoacyl-tRNA synthetases, should be discussed. Like many other proteins that play a role in the protein-synthesizing machinery of the eukaryotic cell (see, for example, Section 10.2.1), some eukaryotic, and particularly mammalian, synthetases are organized in large multienzyme complexes (Dang et al., 1982; Mirande et al., 1983). For instance, a complex with a molecular mass of about 106 daltons and containing nine ARSase activities, namely Arg-, Asp-, Glu-, Gln-, Ile-, Leu-, Lys-, Met- and Pro-RSases, can be isolated from mammalian cells. Two of these activities, GluRS and ProRS, are carried by a single polypeptide. The existence of these enzymes in the form of a complex is not, however, vital to their activity: on one hand, the enzymes may be present in cells individually and not in the aggregate; on the other hand, they appear to function independently on each other in the complex. A smaller complex including ValRS and the elongation factors eEF1A and eEF1B (the so-called "heavy form" of elongation factor 1, or eEF-1H, see Section 10.2.1), was also demonstrated in mammalian cells. appear to be due to the molecular attributes of the enzymes. It has been demonstrated that in contrast to prokaryotic ARSases, their eukaryotic analogs possess an affinity to high-molecular-mass RNA, including mRNA and ribosomal RNA (Alzhanova et al., 1980). This additional property of eukaryotic ARSases correlates with the facts that, compared with prokaryotic enzymes, the synthetases of eukaryotic cells are characterized by somewhat larger subunits, and polypeptide chains of eukaryotic ARSases have extensions at the N-terminus especially rich in basic amino acids. The non-specific affinity for RNA (i.e. RNA-binding capacity) of eukaryotic ARSases may be responsible for their concentration and partial compartmentation on the protein-synthesizing particles.